Babies are expensive. According to a 2010 USDA report, the average middle-income family will spend roughly $12,000 on child-related expenses in their baby’s first year of life. By age two, parents are up to more than $12,500 per year. We’ve managed to save money on child-rearing expenses by choosing to buy used as much as possible. And while we’ve managed to save more than $10,000 in our baby’s first year by doing a variety of cost-saving measures, there are still some items that we felt were worth the expense. 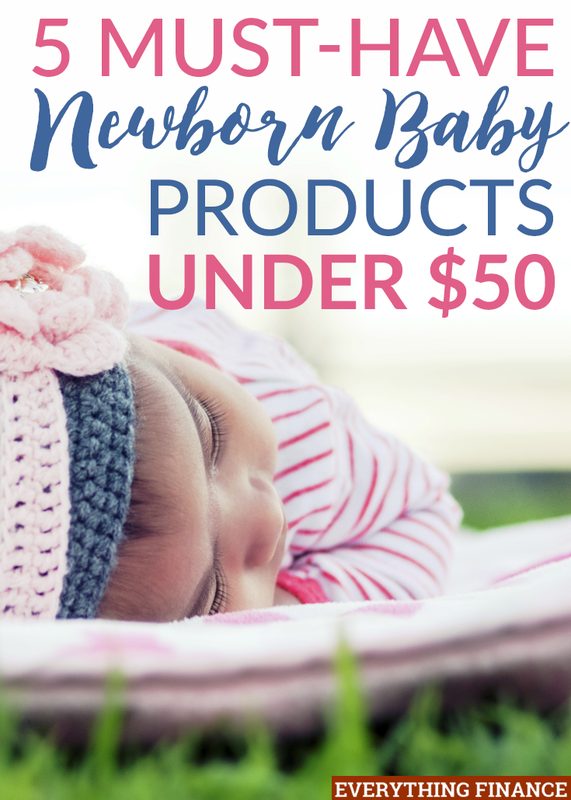 Here are our top 5 must-have newborn baby products under $50. Talk to any seasoned parent and most of them will rave about the Fisher-Price Newborn Rock n’ Play . With a fresh-out-of-the-hospital newborn, you will quickly find that they don’t want to sleep anywhere except on you. And while most new parents enjoy the snuggles, it gets exhausting when you’re surviving on two hours of sleep at a time (if you’re lucky). The Rock n’ Play is here to help during those rough first few months. It’s different from a bassinet or crib because the Rock n’ Play cradles the newborn and makes them feel snug, especially when they’re wrapped up in a swaddle. Our newborn could sleep hours at a time in this, and even now, three months later, he still sleeps in it at night! Swaddle your baby!! For most babies, swaddling helps them feel secure. Newborns don’t know what to do with their arms and legs because they’ve been in such a confined space for nine months of their lives. While it may look torturous to you and me, newborns actually like to be swaddled until they lose the startle reflex that can cause them to wake—which is bad for them and you! For the first-time parent still perfecting the swaddle, a ready-made swaddle blanket like the HALO SleepSack (~$20) or the Miracle Blanket ($30) may be the thing you need. Once you start to feel more confident in your swaddling skills, move on to the Aden + Anais Classic Muslin Swaddle Blankets (4 for $50). If you’re planning to nurse, I consider the My Brest Friend ($35) an absolute must-have. This pillow saved me in those first few weeks of nursing struggles. The first week, I had completely forgotten that I owned this pillow and was using household pillows. When I switched to the My Breast Friend, it was like night and day. This pillow puts the baby at the right height, gives mama the support she needs, and makes breastfeeding a much easier process. I can’t imagine getting through that first month of nursing without this pillow! You’re going to be changing diapers a LOT—that’s a fact. But it’s also a fact that you’ll be waking up your newborn every time you have to change their diaper in the middle of the night. Why not keep the process as painless as possible by using sleep gowns and socks instead of footie pajamas? With a sleep gown (2 for $12 here), there are no snaps or zippers to undo. Just pull the sack up, change the diaper, and you’re good to go! Many parents will invest in a white noise machine ($50) but we’ve found the white noise app works just as well, and it’s free! Help your little one sleep as much as possible by providing them the same sleeping experience as they had in the womb. Parents, what must-have newborn baby products do you recommend? Have you tried any on this list? What do you swear by? I am amazed that these products are less than $50. I love that my brest friend original nursing pillow. It look so comfortable and easy to use, and it’s 100% cotton. Gonna get one of these products. I bought that miracle blanket. My baby is really comfortable using it. And, I must say that it is really useful and very cheap.